When you walk into a house that’s truly clean—as opposed to being simply tidy—you can feel the difference immediately. The air inside is fresh and pleasant, everything gleams and reflects the sunlight, and before you know it, you’re taking in a deep, satisfying breath. Few things are as relaxing as entering a clean, bright, and welcoming environment. Many people blame the age of their carpets, flooring, and furnishings for the lack of this fresh look and feel in their homes. A musty, “lived in” feeling isn’t an inevitable byproduct of age, however; instead, it usually arises due to a lack of regular deep cleaning. Mold, dust mites, pet dander, and dirt have a way of traveling into hard-to-reach places that most of us don’t even know how to properly clean. (Think the inside of your mattress and couch cushions or the interiors of your vents.) Once they find a safe home in these nooks and crannies, dust mites, mold spores, and bacteria proliferate. This is especially likely if you live in a climate that’s even moderately humid—there’s nothing mold and bacteria love more than damp, dark spaces. Even if we can’t see this concealed grime, it can have a profound impact on our health. Mold and dust mites are the most common allergens in the United States, and combined, they trigger reactions in about half of the adult population. These reactions aren’t always severe enough to be obvious, but that doesn’t stop them from inhibiting our breathing and concentration. For asthma sufferers, these hidden triggers can become downright dangerous, setting off asthma attacks, degrading sleep quality, and causing brain fog. The bottom line? 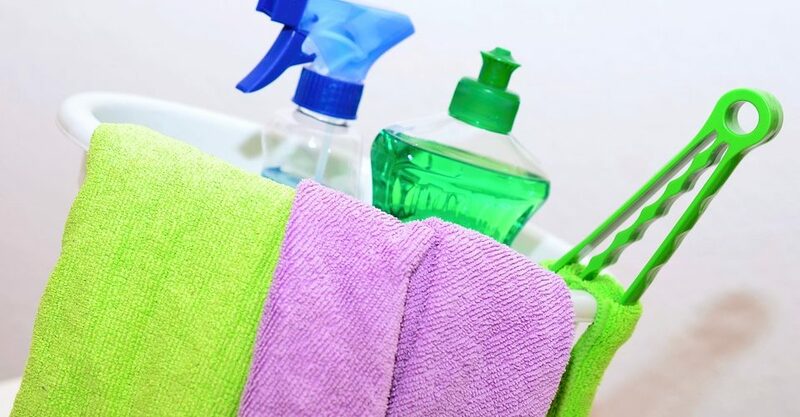 If you’re only cleaning the areas of your home that you can see at a glance, then your home isn’t truly clean… And your health could be suffering as a result. To enjoy the health benefits of cleaning, you’ll need to start deep cleaning your home at least once per month. Deep cleaning is a type of detail cleaning wherein every area of the house is carefully inspected for dust, dirt, and mold and then thoroughly scrubbed down. This should include parts of the home that aren’t easily accessible, like the spaces under your furniture and appliances. Before you start deep cleaning, you will therefore need to declutter your home. You’ll also need to be prepared to move your furniture and appliances and take the covers off all of your vents. If you’re not physically up to this task, don’t attempt to go it alone—call a professional housecleaning service instead. There’s no sense in injuring yourself when most housecleaning companies are now willing to clean homes on an “as needed” basis, without you having to sign a contract. Clean and sanitize the inside of your appliances. You probably already know the importance of keeping the inside of your fridge and microwave clean… But what about the inside of your dishwasher, washer and drier, oven, or portable air conditioning unit? People often neglect to clean the inside of these appliances until they develop an obvious odor, but by then, mold and bacteria growth have already gotten out of control. Did you know, for example, that the seal around your dishwasher could contain almost as much bacteria as the inside of your toilet? Researchers from the University of Ljubljana in Slovenia who studied the biofilm present inside dishwashers found bacteria linked to urinary tract infections, skin infections, food poisoning, and even infections of the heart. Needless to say, you’ll want to take your time when sanitizing this appliance. Disinfect hard surfaces. Counter tops, bathroom floors and tiles, shower stalls and tubs, and toilets should all be treated with a potent disinfectant, like bleach. If you can’t use bleach due to health concerns, try using pure white vinegar, or contact a professional cleaning company to do the job for you. Clean, dust, and polish all of the “little things.” During deep cleaning, you should take the time to clean not just the walls of your home, but also the ceiling, moldings, baseboards, ceiling fans, electronics, doorknobs, light switches and fixtures, doors (including the tops of the doors and their frames), and windows. Don’t forget to dust off your lamp shades, too. Wash all of the linens in your home, as well as your carpets and your furniture. Take down your curtains and wash them, then wash your bedding and mattress cover, washcloths, furniture covers, dish towels, towels, etc. Vacuum your mattress, carpeting, and upholstery thoroughly with a high-powered vacuum cleaner (preferably one that’s equipped with a HEPA filter). Every three to six months, you should also have your carpets and upholstery washed professionally. Vacuuming isn’t able to remove all of the dirt and dust mites that dwell within carpets and furniture, so professional cleaning is necessary to keep allergens at bay. It will also extend the life of your carpets and furniture: Dirt particles usually have sharp edges that slice into carpet and upholstery fibers, eventually making them look flat, worn, and dull. Regular professional cleaning prevents this from happening. Air out your home. Open up all of the windows in your home as soon as you have a cool, clear night, and leave them open for at least a few hours. Place fans near the windows, facing outwards, to pump the stale air out of your home. If, after you have done all of the above, your home still smells dusty or musty to you, you should call a professional cleaning company or indoor air expert. You probably have hidden mold or dust deposits deep inside the ventilation system in your home. Usually, however, a thorough deep cleaning is all that’s needed to get your home looking—and feeling—like new.